Revenue is rising and margins are expanding for the package delivery giant, but investors haven't noticed. Last week, FedEx (NYSE:FDX) finally got the official word that European regulators will not challenge its planned acquisition of Dutch rival TNT Express. While this news was expected, it is still a key milestone, as it removes the last major obstacle stopping the merger. Acquiring TNT will make FedEx a much more viable competitor to DHL and United Parcel Service (NYSE:UPS) in Europe. Meanwhile, adding TNT's roughly $7 billion in annual revenue will put FedEx nearly on par with UPS. The TNT acquisition will boost FedEx's presence in Europe. Image source: The Motley Fool. However, expanding in Europe and other overseas markets its just one aspect of FedEx's strategy to grow revenue and profit. With FedEx shares having been caught up in the recent stock market rout, it looks like a great time for investors to bet on the long-term success of this global powerhouse. With the acquisition of TNT, FedEx will hold roughly 22% of the European express delivery market -- just behind UPS, which has 25% of the market. Combining TNT's strength in Europe with FedEx's massive aircraft fleet and strong presence in the U.S. and Asia will create a compelling value proposition for customers. The TNT merger should also open up cost synergy opportunities. FedEx will be able to eliminate duplicative jobs between the two companies and consolidate shipments onto fewer flights and road delivery routes. FedEx is also in the midst of a multiyear effort to improve its efficiency in other markets like Asia. For example, it has cut some of its flights between the U.S. and Asia in recent years to match the market demand for express service. Meanwhile, it is using cheaper "purchased capacity" -- such as the cargo space on passenger planes -- to carry lower-value shipments. FedEx is replacing the older aircraft in its fleet with more efficient models. Image source: The Motley Fool. FedEx has also been refreshing its aircraft fleet at a steady pace and will continue to do so for the foreseeable future. Its new planes use less fuel, cost less to maintain, and are more reliable, reducing expenses both abroad and within the U.S.
An equally important source of growth for FedEx is the domestic ground delivery business. FedEx Ground has gained market share from UPS for a stunning 16 consecutive years. FedEx Ground revenue totaled $13 billion last year, up from less than $5 billion a decade earlier. Thanks to big investments in automation, FedEx Ground offers faster delivery speeds than UPS on nearly 30% of its routes. By contrast, UPS has a speed advantage on just 3% of its routes. This competitive advantage should allow FedEx Ground to continue gaining share. Additionally, FedEx's purchase of reverse logistics specialist GENCO about a year ago added another weapon to the company's arsenal. FedEx founder and CEO Fred Smith recently noted that processing returns is a key logistics hurdle for e-commerce companies. GENCO is a leader in that market, which improves FedEx's value proposition for online retailers. FedEx is also focusing on efficiency in its ground delivery business. It recently embarked on a key technology project that is allowing it to merge its core FedEx Ground business with FedEx SmartPost (a cheaper service that uses the post office for final delivery) to reduce costs. It has also started charging more for bulky packages in order to incentivize shippers to use more space-efficient packaging. Despite being nearly as large as UPS by revenue and posting faster earnings growth, FedEx's market cap is currently less than half that of UPS. 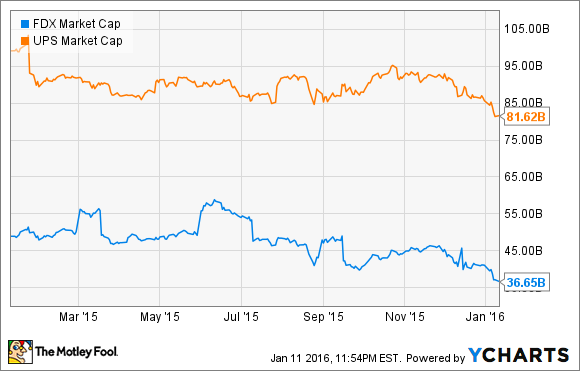 FedEx vs. United Parcel Service Market Cap. Data by YCharts. Indeed, FedEx stock now trades for just 11 times forward earnings. Meanwhile, UPS stock still trades for 16 times forward earnings, despite the recent stock market swoon. There's no logical justification for FedEx's huge valuation discount. As the company continues to execute its plans to grow its revenue and boost its profit margin, FedEx shares are likely to produce solid gains.